World's best scouting tool for FM19. 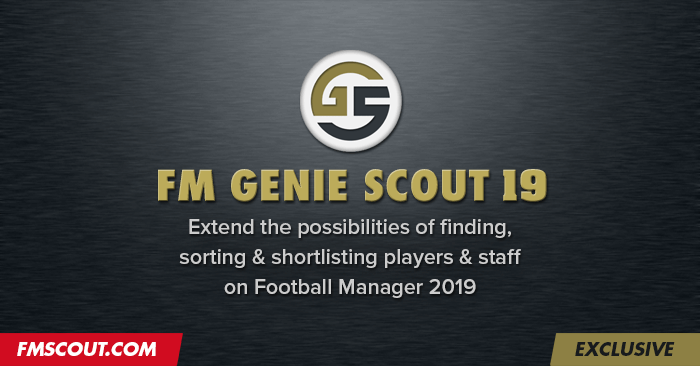 Extend the possibilities of finding, sorting & shortlisting players & staff on Football Manager 2019. Last updated: March 31st, 2019. 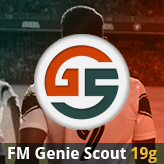 Welcome to the official download page of FM Genie Scout 19, the best real-time scout tool for Football Manager 2019. Exclusively available from fmscout.com since 2009. We don't allow sharing Genie Scout 19 directly on other sites. Please point the download link to this very page. You cannot host any files yourself. Does it work for Mac or Linux? Can I use it to edit attributes and other details? Extract the downloaded .zip file and run the setup .exe file. Follow instructions until installation is finished. Run Football Manager 2019 and load your saved game. Launch Genie Scout 19 and from main menu click "Load Game". We have a detailed instructional guide to Genie Scout. Make sure to read it. The public edition comes with 2 banner ads. The "g" edition has no ads and includes a few minor extra features. In order to get the "g" edition, you need to donate to Eugene. Eugene has automatized the process of distribution for the "g" edition, so you will have to wait just a few minutes before you receive a download link. Another email containing the key file might take a while though. But only if they have sent correct contact email, correct Unique ID alongside your donation. Make sure you check your Spam folder too. It might take up to 24 hours though. In case of problem with your donation, please contact Eugene using the email address you'll see in the message after donation. Donations are handled by Eugene. He will deliver the ad-free version to you after donation. During closed beta stage for supporters, Eugene fixed most bugs that came to surface. As a result, the public edition should be quite stable from its very first version. Should you find a bug, please report it to the Genie Scout forum. Read this before submitting any bugs! Known issue: Sale value for players is not accurate and sadly we have no way of making it work as it used to be before GS13. Any comment including bug report posted on this page will be removed on sight! Please understand it is forbidden by the EULA from SI and SEGA to export all the data from the results. You should be able to export only basic information such as player name, club, age, etc. Genie Scout 19 is created by Eugene Tarabanovsky. He has been developing this amazing scout utility for the past 13 years! Genie Scout logo made by Stam. 212 comments have been posted so far. Brilliant work once again, just wondering if there's any plans for the addition of the new roles such as the segundo volante or pressing forward for the role ratings? the error keep popping up "script error" and "the requested resource in use" for every minutes. and i can't view player's attribute when double clicking on player this error popped up : "cannot make visible window modal". just keeps saying 'wait till FM19 database is loaded' when the game is loaded and fully running???? hello, i have downloaded the 19g edition (beta 10) but when i load the game, the staff and the players nationality is different than the real one. is there any bug or something else. it's the first time that this is happening and i don't know why..
@xxbati: No. Genie Scout is strictly a scouting tool. It doesn't affect the data in any way. May I get informed what exactly are the extras you get with the G version? Yes! Been waiting for this for ages since I'm unable to pay you with my local bank card. I'm opening a new bank account soon so hopefully can pay for the full version shortly. is this effect the global table (hall of fame)? Handcrafted in Symi, Hellas. Page created in 0.377 seconds.